My draping on the stand adventure continued with the requirement to create a pegged skirt. This design was very popular in the 1950s, and then in the 1980s. Here are a few pictures. It is a particular look. The straight grain is pulled upwards to create width at the waist and a narrowing at the hem. Then the excess fabric at the waist is draped or folded to give fullness at the hip. It can be relatively subtle, just looking like a pleated straight skirt, or fairly exaggerated and design-y. In style terms this skirt is best for women with a straight body shape and slim legs. The shape of the skirt – with width at the hips and a narrow hem is not the most flattering for women with an hourglass shape (ie me). However I thought I would give it a go and let you be the judge of whether or not this style can be worn by curved figures. I decided to drape this skirt in the fashion fabric, rather than calico. I am not sure I would do that again for such a complicated design. I really struggled to get this to work and would have liked to use the model in calico-transfer to paper-true the pattern-choose suitable fabric-cut out and make up. I thought doing this skirt in fabric would be a bit more challenging and it was. mark the CB waist (just the first few inches) and the hip (all the way around) with basting threads so you can see what is happening. 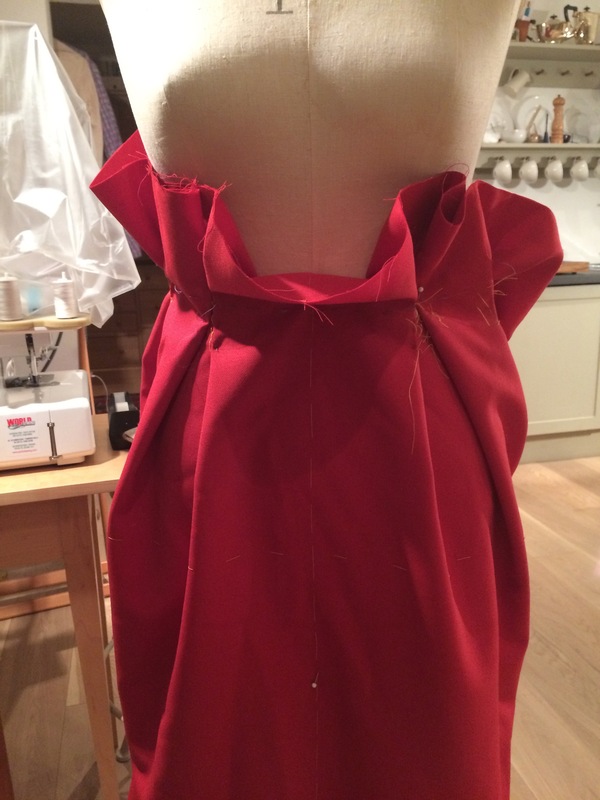 when you are pleased with the design, mark the waist, gathers/pleats etc. Here are a couple of photographs from the lecture. I am sorry the second one is rather dark. I had brought in about 1.4 metres of a fairly firm wool with some polyester, which contains elastane. I figured if the skirt was very slim around the leg area I could do with a little stride room. Lynda suggested that I start my draping at the CF so I trace tacked the CF, hip and front waist on the fabric with bright yellow thread before I started. I then spent a couple of hours, pulling, folding, and working. My first efforts had the CB on an angle but not extreme enough to create the kind of fullness I was seeking. It just looked like a normal pleated skirt. So Lynda helped me redrape the back so that the CB was more or less on the true bias. This gave my skirt the more exaggerated, structural look I was seeking. And here is my skirt (photographed (slightly crumpled) at home the next morning). I found this a difficult project to get my head around, and I am glad I persevered. I spent another evening “faffing” around with this skirt, and I will report on progress very soon. I must rush as I am hoping to wear this skirt on Monday. Pretty colour! I hope you can get around to photographing the shape of the pattern, I can’t quite get my head around the back being on the true bias. Jay – I did find it a difficult concept at first, and thought I was being rather dense. It is a relief you struggle a bit too. In terms of the pattern, in the second photo you can see what the teacher has done, I hope. The CB is on the selvedge on her right, with the CF on her left, more or less on the bias. I will post about this skirt again in a few days. I see what you mean now – the fabric to form the pleats is added in, in deep triangles, and if you have enough of them it throws either the CF or CB to a bias angle. I love the shape of the peg skirt so I’m really looking forward to seeing how this one turns out. I’m glad you use the word ‘faffing’. It is one of my favourites when referring to all the messing around I do with sewing and other creative projects before I arrive at an acceptable conclusion! Jay’s comment is so funny as I had the same initial thought – how the heck…? But I think I can see it a bit in the pattern envelope designs. Very neat. Love seeing your design experiments (including the interesting skirt you posted yesterday, which looks nice on you). I admire your curiosity and persistence! Or do you just see this as a sandbox with fabric? Lynn – thank you for this comment. I didn’t initially understand what “sandbox” meant. In UK English it is a “sandpit” – a place where little kids make temporary structures from slightly damp sand. A safe place where they can do messy play. I have now discovered that in computing a “sandbox” is where you can safely experiment, so that figures. So yes I am playing, and experimenting and coming up with ideas that are very new to me and very exciting. But also I am beginning to find some fresh shapes that I can definitely wear. I like the look of this skirt – and the colour of the fabric. I think it will look terrific. I don’t see you as a woman with curves btw! I can see you in this skirt – me, no. I did occasionally wear slightly pegged skirts in the 80s.I’m amazed at the speed of your constructions! This course seems very inspiring – even when the shapes aren’t what you would usually want to make. I love Lynn Malleys comment! A sandbox with fabric. Perfect!